Jaruwan is heading the field implementation of MAP’s EPIC project which is demonstrating the use of Community Based Ecological Mangrove Restoration (CBEMR) to restore abandoned shrimp ponds back to biodiverse mangrove which will provide a green bio-shield to the vulnerable island communities in times of tropical storms or even a tsunami. If large numbers of island ponds are rehabilitated back to mangrove forest then Ecological Disaster Risk Reduction (Eco-DRR) will be achieved. This is a nature-based solution to climate change, which is causing sea-level rise and more intense and frequent tropical storm during the monsoon season. Bastian accompanied Jaruwan to (Koh) Klang Island in the province of Krabi where much of the mangrove forests have been destroyed by shrimp ponds that have been dug into the mangroves over the past 20-30 years. Now, no shrimp ponds are in operation on the island while most are completely idle, except for a few fish raising ponds. 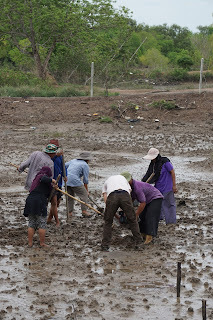 The film shows Jaruwan working with the locals to drain the water from the abandoned ponds so that the adjusted hydrology will encourage natural regeneration to occur restoring the mangrove biodiversity as opposed to planting mono-culture plantations. 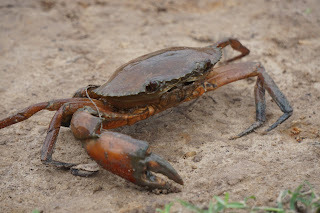 The film draws attention towards the black mangrove mudcrabs (Scylla serrata) - a high economic value species now returning in Imam Sanee Klongrua’s pond one of the EPIC demonstration sites. Mangrove seedlings and samplings are now sprouting in the Iman’s land, but unfortunately, the young trees have been damaged by the free roaming goats. Progress has been reduced due to the grazing goats, so fences are put in place to better protect the sprouting trees. Jaruwan hopes that the CBEMR site will be a model promoting the potential of mangrove restoration to other island pond owners. Many people are benefiting for the mangrove reforestation after charcoal concessions have ended in the 1990s. Now even the recreational fishers recognize the value of the mangroves because their daily catches have increased. On the pier in Krabi town, Mr. Kriangkrai Klongrua offers mangrove tours by his long- tail into the Krabi River Estuary Mangrove Ramsar Site. He also values the mangrove forests because his own livelihood as an eco-tourism boat operator depends on tourists seeing exciting species like monkeys, snakes and mud crabs. 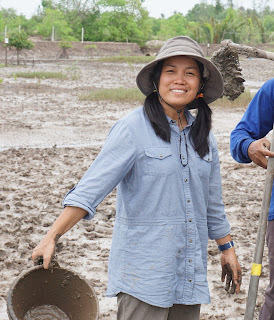 Jaruwan has goals that are bigger than ecological success; she wants the people to experience the value of the mangroves. Creating an appreciation creates sustained protection of the mangrove forests. She hopes successful rehabilitation will encourage more communities to give MAP a chance to help bring back the former lush and valuable mangrove forest. To view the 8 min. video: "New life in old shrimp ponds"